LaCie's Bigger Drive stores an amazing Terabyte of data, but with this much to lose, backup becomes even more important.Tape is looking like an endangered species. This statement comes as no surprise to anyone familiar with the audio business: in fact, we've known about it for at least 15 years. The moment we could record stereo, CD-quality audio onto a computer's hard drive, there was simply no way we were going back to tape. Instant location, no rewind time, and no possibility of edge-damage or mangled andbroken tape... all compelling arguments for dropping tape altogether and turning to direct-to-disk recording — as it used to be called. It's easy to forget just how revolutionary recording to disk drives seemed when it first came along. At that time, most of us were still grappling with the idea of digital audio in any form, and where you found digital audio in a studio it was more often than not tape-based anyway. If you couldn't afford a Sony DASH (Digital Audio Stationary Head) 24-track recorder, at the very least you'd have a DAT machine. Fast forward a few years and the cost-effective — which is to say cheap — way to record multitrack digital audio was with an ADAT or DA88. As many will no doubt remember, these were 8-track digital audio tape recorders that could be sync'd together to give you almost any number of tracks. It wasn't just the fact that hard disks were so expensive that kept them out of reach of the average musician (you could pay thousands for a fraction of a Gigabyte) — it was more that the disks were installed in the most hallucinogenically expensive, exotic gear: Synclaviers, Audiofiles, Waveframes. Wonderful names for kit whose performance then you can emulate now with even the humblest new PC from the shop down the road. Affordable disk storage is not glamorous, and it doesn't make interesting noises (except, perhaps, when a disk drive is on its last legs), but it's had a huge impact on how we work as musicians and — just as important — how we store the results of our work. The news about storage is mostly good. It's getting cheaper, and it's getting bigger. But therein lies the problem, because it doesn't seem to be getting more reliable. Regardless of whether drives are getting more or less reliable (the fact that drive manufacturers are reducing their warranty periods suggests the latter), the problem is becoming more serious anyway, simply because the bigger the drive, the more stuff we'll have stored on it — and the more stuff we'll lose when it goes squeak-squeak-clunk. Just imagine you'd made your own sample library. Even if it was only a few Gigabytes in size, if you only had it on one disk it could be gone in an instant. The fact is that the bigger drives become, the more tempting it is to think you can store all of your life's work on a single drive. Of course you want to: it's so convenient! But it's also a dangerous thing to do. When you save a project, save it in several places, maybe to a second hard drive or even a USB or FireWire one. Don't just overwrite the previously saved project — you may need to go back to it or an earlier one. If your project gets corrupted, overwriting the earlier, valid project will leave you with nothing. Save projects as Project 1.1, 1.2, etc. It's like having an infinite, selective undo facility. Then back up that data to a CDR. Make several copies. Keep one at a friend's house and one in your car. Understand how to back up projects from each type of software. A project file is no good without the media. Make sure that your backup routine includes media, project files, setup files, samples, sample mappings, and any other kind of data that you'd need to reconstruct if it went missing. Do a trial backup, and (backups are useless without this) make sure you can restore from the backup. Don't use weird backup formats that aren't going to be around in a year or two, or which won't be supported next time you upgrade your OS. I've got a pile of tapes containing my last 15 years work, but I can't read any of them because the computers that made them are in a skip, with the tape drives. My best bet for restoring this data is to make regular visits to car boot sales. So what can you do if you want to store masses of vital stuff on a big drive? The first thing to consider is backup (see box below), but there's also another way to make the consequences of a drive failure less than disastrous. It's called RAID (Redundant Array of Inexpensive Disks). We've talked about RAID before in Cutting Edge. It's where you take a bunch of hard drives and run them either in parallel or arranged so that your data is spread across them with duplicate (redundant) information that lets the system reconstruct all the data if any of the drives fails. RAID isn't new, but what is new is that it's becoming affordable. It's come from the heavy-duty end of the IT spectrum, where huge databases have to be kept online 24 hours a day, and the consequences of down-time justify the costs of the equipment. But now we're starting to see RAID built into PC motherboards! 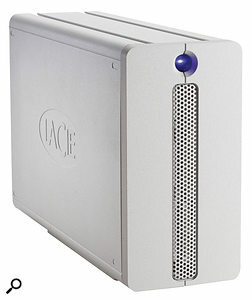 And some manufacturers, such as LaCie, have started to take advantage of the fact that huge drives are so cheap, by offering RAID systems that don't cost much, with capacities as big as a Terabyte. Now, you need to be careful with RAID systems, for several reasons. First, not all RAID systems protect your data. In fact, some of them expose it to additional risk. Why? Well, when you group a bunch of drives together (and, by the way, the technical name for a bunch of drives which are not in a RAID is 'JBOD', which stands, believe it or not, for 'Just A Bunch Of Drives') you can arrange them to give you extra speed or extra safety — but (with some complicated exceptions) you can't have both. RAID systems like this one from Fibrenetix are becoming affordable enough for more musicians to consider.If you want speed, what you do is 'stripe' the drives. Striped sets of drives are essentially running in parallel, as if they were all part of one disk. A simplistic, but useful, way to understand this is to imagine that you have some data that, if you had one disk, would take one complete revolution of the disk platter to read. Now, think about what would happen if you had two disk platters running in parallel, one on top of the other, on the same spindle. If the data was spread between the two drives (let's say each even bit goes on the top one and each odd bit goes on the bottom), the same chunk of data could be read in only half a platter revolution. Which means, of course, that it would take half the time to read and the disk would effectively be twice as fast. You can add more and more disks to a stripe, and even though you don't quite get speed increases directly proportional to the number of drives, the speed goes up with the number of drives. So, unfortunately, does the risk to your data. Now that you understand what's going on with data on the drives, you can see what would happen if one of them were to fail: you'd lose part of your data. And since the data is distributed between the drives at such a low level (at the level of bits, in fact) what you'd end up with is completely corrupted data. If you need the speed, then you need a striped set of disks, and you'll just have to take the risk. The only way to reduce this risk is to make regular backups. No surprises there. You've heard about RAID. Now (and remember you read it here first!) there's also MAID. MAID stands for Massive Array of Idle Drives. You might well ask what good an array of idle drives could possibly be, but there's method to this madness. Disk drives are now so cheap that it's beginning to look as though they could replace tape for backing up and archiving. The main drawback is no longer price but power consumption. The idea of MAID is that loads of cheap drives are used to store data online, except that where drives are not being accessed they stop spinning. It doesn't take much time to spin up a drive — and certainly much less than it takes to load a tape from a robot archive and wind forward to find the relevant file. Of course, the capacities of MAID systems are way in advance of what any individual might ever need. But I can see a use for them as a kind of self-storage facility where computer musicians worldwide use one to upload their projects for archiving. I'd certainly be willing to pay a reasonable amount for a service like this. Let's now consider what you can do with RAID if you don't really need blistering read and write speeds from your drive array. The good news is that the less you configure your RAID system for speed, the more secure your data becomes. The RAID configuration I think I'd go for is the simplest of all. It's called 'mirroring' and is an almost self-explanatory method that involves just two identical drives. In a mirrored drive set, all the data is duplicated to the two drives. If one fails, the other is instantly available. It's no faster than using a single drive, but probably not significantly slower, either. The only advantage is that the two drives would have to fail simultaneously before you'd lose all your work, but this, to me, is a great first-line defence against disastrous loss, and well worth paying a hundred pounds or so extra for. A word of warning, though: if you set up drive mirroring on your computer, make sure it works. Try removing a drive to see if the system can switch to the other drive. (Turn the computer off first.) I've heard reports from users who, despite having apparently set up mirroring correctly, found that it just didn't work. Finally, it doesn't matter how robustly your RAID system stores your life's work if it gets stolen, burnt down or flooded. Whichever way you look at it, you're going to have to make that backup.